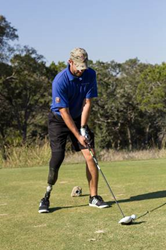 Howell Instruments is sponsoring a talented amateur golfer and wounded hero, Army Sergeant First Class (Ret.) John Faulkenberry to play with professionals and celebrities in the Dean & Deluca Invitational Pro-Am Tournament Wednesday, May 25 at Colonial Country Club in Fort Worth, Texas. John Faulkenberry served his country with valorous distinction and spent nearly a decade overseas with multiple deployments. He served with the 173rd Airborne Brigade Combat Team in Afghanistan, where his unit was involved in some of the fiercest fighting outside a small village in the Korengal Valley. He was awarded the Bronze Star Medal with Valor for the actions he performed during combat, additionally he received the Purple Heart for wounds he sustained while performing combat operations. John uses golf for his recovery as a form of rehabilitation and return to normalcy. With Howell’s sponsorship, he will get the fantastic opportunity as an amateur golfer to play in the Pro-Am alongside the PGA’s best. As the Skills4Life Program Director for Military Warriors Support Foundation, John continues to serve our nation by helping combat wounded veterans and their families develop relationships with mentors and fellow heroes. Part of John’s heroic efforts with his fellow servicemen is recounted in the New York Times bestseller, 'The Outpost: An Untold Story of American Valor' by Jake Trapper. For more information about Military Warriors Support Foundation, visit http://www.MilitaryWarriors.org. For more information about Howell Instruments, visit http://www.howellinst.com. Howell Instruments, Inc. is a privately-owned aerospace engineering company headquartered in Fort Worth, Texas. With over six decades of aviation and engineering experience, Howell designs and produces leading-edge aviation solutions and products for military and commercial customers across the globe including: cockpit engine instrumentation, gas-turbine testing equipment, advanced airborne engine monitoring systems, test cell data acquisition systems. Howell Instruments provides specialized engineering services, as well as complete overhaul of ground support equipment.